I N J U N E , Carrie Swidecki made history by becoming the second woman and first exergamer to be inducted into the International Video Game Hall of Fame. 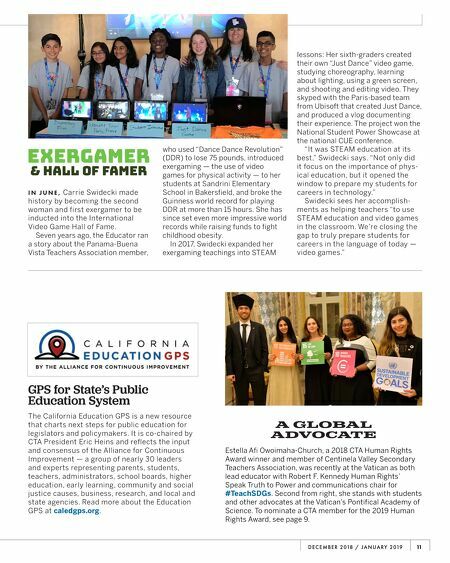 Seven years ago, the Educator ran a story about the Panama-Buena Vista Teachers Association member, who used "Dance Dance Revolution" (DDR) to lose 75 pounds, introduced exergaming — the use of video games for physical activity — to her students at Sandrini Elementary School in Bakersfield, and broke the Guinness world record for playing DDR at more than 15 hours. She has since set even more impressive world records while raising funds to fight childhood obesity. In 2017, Swidecki expanded her exergaming teachings into STEAM lessons: Her sixth-graders created their own "Just Dance" video game, studying choreography, learning about lighting, using a green screen, and shooting and editing video. They skyped with the Paris-based team from Ubisoft that created Just Dance, and produced a vlog documenting their experience. The project won the National Student Power Showcase at the national CUE conference. "It was STEAM education at its best," Swidecki says. "Not only did it focus on the importance of phys- ical education, but it opened the window to prepare my students for careers in technology." Swidecki sees her accomplish- ments as helping teachers "to use STEAM education and video games in the classroom. We're closing the gap to truly prepare students for careers in the language of today — video games." GPS for State's Public Education System The California Education GPS is a new resource that charts next steps for public education for legislators and policymakers. It is co-chaired by CTA President Eric Heins and reflects the input and consensus of the Alliance for Continuous Improvement — a group of nearly 30 leaders and experts representing parents, students, teachers, administrators, school boards, higher education, early learning, community and social justice causes, business, research, and local and state agencies. Read more about the Education GPS at caledgps.org. Exergamer & Hall of Famer 11 D E C E M B E R 2 018 / J A N U A R Y 2 019 A Global Advocate Estella Afi Owoimaha-Church, a 2018 CTA Human Rights Award winner and member of Centinela Valley Secondary Teachers Association, was recently at the Vatican as both lead educator with Robert F. Kennedy Human Rights' Speak Truth to Power and communications chair for #TeachSDGs. Second from right, she stands with students and other advocates at the Vatican's Pontifical Academy of Science. 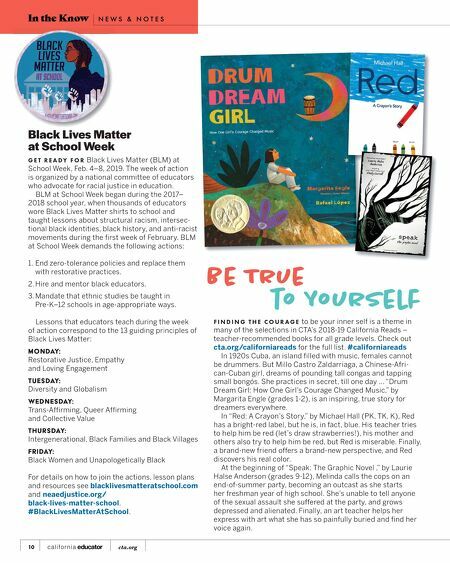 To nominate a CTA member for the 2019 Human Rights Award, see page 9.